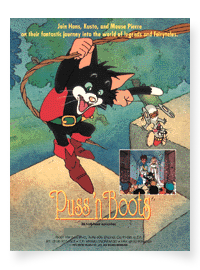 Come along and travel with PUSS 'N BOOTS and his friends Hans and Pierre the Mouse as they begin an exciting and magical journey into the world of fairytales and adventure. This new series takes the famous characters from the Charles Perrault story and transports them into the land of other famous fairy tales, such as Cinderella, Sleeping Beauty, The Little Mermaid and many more. A young man named Hans inherits a cat who turns out to be quite an ingenious character. The cat's name is Kusto and when he puts on a pair of boots, magically he has the ability to talk. Kusto gets Hans into a number of funny and dangerous situations such as convincing Hans to masquerade as a powerful Marquis. Hans meets a beautiful princess and they fall in love. The King announces their engagement and Mouse Pierre is given the task of delivering wedding invitations to all the Fairies and Wizards living in the kingdom. Mouse Pierre is given the task of delivering wedding invitations to all the Fairies and Wizards living in the kingdom. Mouse Pierre fails to deliver the invitation to one particular Fairy. In her outrage, the Fairy puts a spell of eternal sleep on the beautiful Princess just as the wedding is about to take place. Hans, Kusto and Mouse Pierre set out to find this Fairy and ask her forgiveness by lifting the spell of sleep from the beautiful Princess. Their fantastic journey into the world of legends and fairy tales creates endless possibilities of exciting adventure. Classic stories and wonderful lessons are drawn from the wonderful tales of Hans Christian Anderson and the Brothers Grimm. An ordinary cat until he puts on a pair of magic boots. These boots give Kusto a cunning wit and the ability to talk. The youngest of three sons from a very poor family. He leads an ordinary life, until he gains possession of a most remarkable cat. Sly and quick, careless and troublemaking, he joins Hans and Kusto on their adventures through the land of fairy tales. His prize possession is his daughter. He banishes Hans from the kingdom to gain worldly knowledge, because he knows in his heart that Hans has the qualities to become his successor. The only daughter of the King. She falls in love with Hans at first sight. The Princess believes in Hans and awaits his return. Produced by Enoki Films Co., LTD.